As with many names beginning with com, this name originally applied to a deep hollow on the side of the mountain. According to Seán Ó Súilleabháin the peak is also known as An Sagart. A cliff on the north-east side is named Leam a Soggorth, an anglicisation of Ir. Léim an tSagairt, 'leap of the priest' , a name which probably preserves a memory of a tale of a priest escaping from pursuing soldiers in Penal times, much like the Priest's leap between Bonane and Coomhola, near Glengarriff. On the Discovery map no. 78 the Irish name of the summit is An Tráigh [OSI], 'the strand'. Perhaps this is a humorous name for the large stony patch without turf cover near the summit. For further information on the name, see Paul Tempan, Some Notes on the Names of Six Kerry Mountains, JKAHS, ser. 2, vol. v (2005), 5-19. 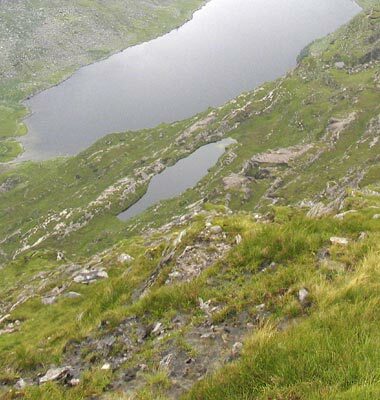 Coomacarrea is the highest mountain in the Glenbeigh Horseshoe area and the 61st highest in Ireland. Picture from simon3 : An illusion of closeness. Picture: An illusion of closeness.